Sometimes, life can get overwhelming. You have hundreds of things to do and it seems like your days just keep getting shorter. No doubt, you’ve probably tried making lists and schedules and while they worked for a while, their effectiveness was fleeting. There is a difference between a to-do list and an effective to do list and learning how to make one will change the way you get things done. Hopefully, these tips will help you accomplish your goals and help minimize your stress. This is a hard one and will definitely take some time to tweak, but in order for your list to be effective, you need to write down realistic goals. Take into account how much time you have and how important the items are before you put them down. If it helps, make two lists: One for things that need to be done immediately and more general ones for the future. When you start writing your list of realistic things that you need to get done, be as specific as possible. This will help you focus when it comes time to do the things on your list. So, instead of saying “Clean the Kitchen”, write down “wipe the counters”, “empty out the fridge”, or “fill the dishwasher”. Having these smaller, step-by-step tasks will make the concept of ‘cleaning the kitchen’ much more doable. Having things to do is one thing, but being overwhelmed by them is a completely different matter. However, if instead of looking at everything you have to do and worrying about that, you focus on one thing at a time, you’ll find yourself much less stressed. That’s why descriptive to-do lists work so well. You have these small things to do, which will snowball into the bigger things you want to accomplish. And, since you can do these smaller things easier, it will keep you from being stressed because you’re actually doing something. This is kind of a continuation of #3. Put your most important things at the top of the list, so that you get those done first. You’ll be surprised at the weight that falls off your shoulders when you get to check something off that has been pressing on you. And, by putting these things first and completing them, you’ll definitely be able to look back on your day and say you’ve accomplished things. 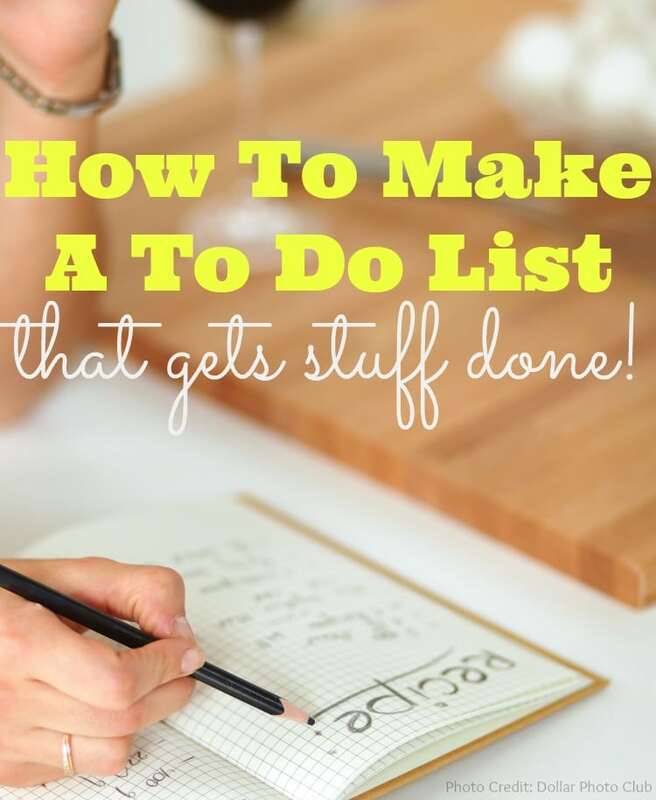 As mentioned in #1, you can have multiple to-do lists. One might be for the day, the other for the week, and another that’s more general. Breaking these activities into bit sized lists will help you focus. It’s a well-known fact that when the mind feels too stressed, it starts to shut down. So, having a list of 5-10 specific and realistic items to do will keep you motivated without the stress that comes with seeing a never-ending list of things to do.